We love Vi-Shape® Shake recipes that do double duty. This pineapple-orange-banana Vi-Shape Shake infused with centuries of age, healing turmeric includes all the healthy benefits of Vi-Shape plus a peppery punch with huge antioxidant properties your body and taste buds will really love. What is Turmeric and Curcumin? Turmeric is part of the ginger family and has a warmish, peppery, bitter taste. One of the most essential, active compounds that gives turmeric its anti-inflammatory and antioxidant properties is curcumin. Consuming curcumin with black pepper aids in absorption. Pineapples and oranges are literally bursting with immune boosting vitamin C– another antioxidant that, like turmeric’s curcumin, helps ward off free radicals and aids in preventing cellular damage. It’s time to enjoy your shake on… Turmeric Shake Recipe details below! 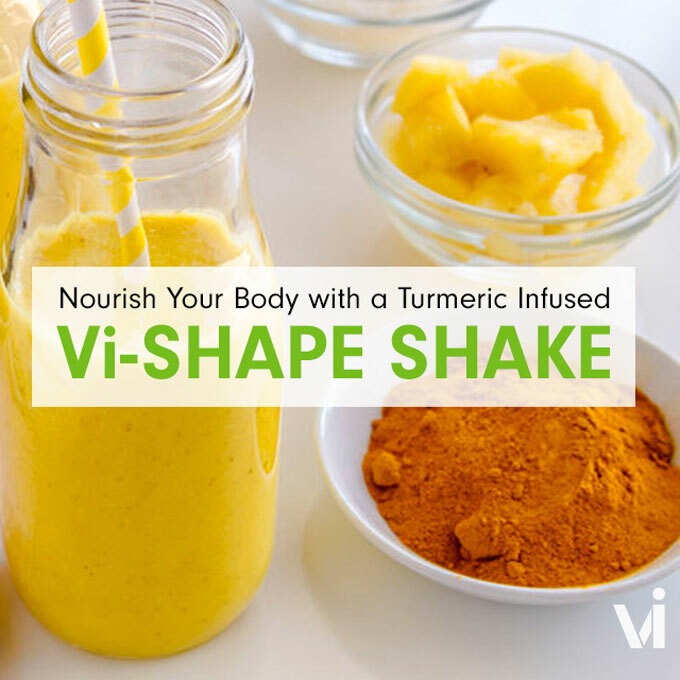 Nurture Your Body with a Turmeric Inspired ViShape Shake! In a blender, add all ingredients until well blended smooth and creamy. Garnish with toasted, unsweetened coconut flakes or add a dash of coconut powder. Let us know what you think about this ViShape Turmeric Shake.